4 Bedroom Detached House For Sale in Wadhurst for Asking Price £985,000. Set at the end of a country lane with views over Bewl Water, this property is a delightful, very traditional converted barn that is Grade II Listed. The interior layout has flexible accommodation with numerous exposed timbers and beams and tall windows enjoying the stunning outlooks towards Bewl Water. The kitchen/breakfast room is well fitted and equipped with space for freestanding appliances an extensive range of cupboards and drawers with solid wood work surfaces and terracotta tiled flooring, the room extends through to the breakfast room with oak flooring, tall windows and door to a raised decking terrace. An adjacent utility room opens to a former piggery which is currently used as a gym area. The spacious sitting room with dining area is a delightful room with exposed beams and timbers and a brick surround inglenook, this room opens to a family room with oak flooring and door opening to the decked terrace. The principal bedroom which is on the ground floor has a door opening to the rear and an adjacent bathroom with separate shower cubicle. To the first floor a galleried landing has a mezzanine above and three further bedrooms, two with fitted wardrobe cupboards and all well served by a shower room. 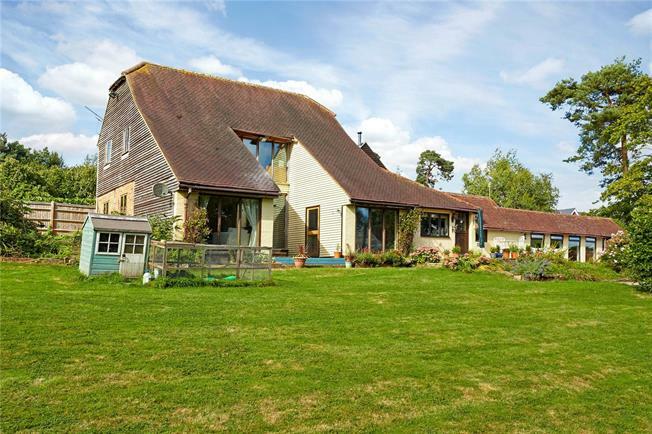 This barn benefits from wonderful rural views over surrounding farmland as well as to Bewl Water. Both Ticehurst (about 3 miles) and Wadhurst (about 4 miles) offer a good range of local amenities including shops, primary schools and public houses. Tunbridge Wells (about 10 miles) has excellent shopping facilities including many national stores and a wide variety of shops. Recreational amenities in the area include fishing, sailing, water sports and bridle paths at Bewl Water, golf at nearby courses, and in Tunbridge Wells a cinema complex and theatres etc. The property is approached by a no-through country lane and accessed by a 5 bar gate to a parking area and to the Heritage style barn. The former milking parlour has been converted to an excellent self-contained detached annexe with open plan living area and bedroom, small kitchen and shower room. The large gardens are laid mainly to wide expanses of lawn with a paved terrace by the house with paddock beyond. In all about 2.9 acres which adjoins and area of woodland. Train Services: Wadhurst station for trains to Charing Cross, London Bridge and Cannon Street about an hour.